I’ve had to give up most coffee and all chocolate, because of migraine headaches. No, I’m not happy about it. The headaches are so much better, but cutting back on those was not my first choice. I don’t drink alcohol, I don’t smoke anything, and aside from work, I’m running out of vices. Happily, GEDmatch.com has stepped in to fill that vice void. GEDmatch is a wondrous thing — I can’t stop laughing about how amazing it is. Very simply, you upload your raw DNA data (that you get from Ancestry.com or 23andme.com or some other ancestry DNA service). In a matter of minutes, they parse it all out to tell you what populations your DNA comes from. I’ve spent more hours than I can count, combing through the results. And wonder of wonders, they now have a spreadsheet feature(!) that shows you the “Oracle” breakdown of all your source populations. That shows you breakdowns by source populations in more detail. The Oracle results show you distances and percentages and the Oracle-4 results give you even more detail around source populations. You can even choose to see your chromosome makeups. I ran the numbers the other day, and under the MDLP calculations, I came away with 662 different populations. I studied the list, which was chock-full of all kinds of surprises (including LOTS of Subsaharan Africa DNA). However, it seemed like it might be more “enthusiastic” than is prudent. After a bit more reading online, I discovered that MDLP is not quite as reliable as I’d like. And the Eurogenes calculator was more reliable. 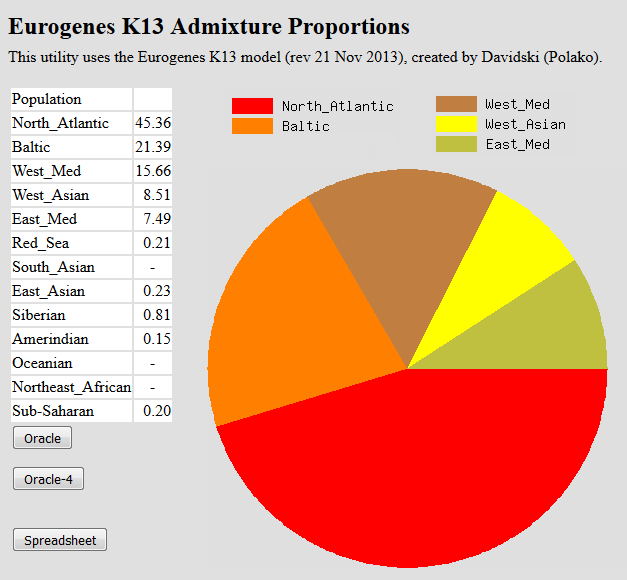 So, of course I re-ran my data through Eurogenes (K13), and I came away with 204 source populations, which seemed more reasonable. But still — all those surprises… including DNA from some of the earliest genomes sequenced, ever. Chances are, we all can trace our DNA back to 7,000 year-old caveman remains with both European and African DNA, but it’s super-cool to see myself connected to that, no matter how distant the connection may be. The thing that strikes me, as I comb the list of all these DNA influences, is that many of the assumptions I’ve made about my heritage could use some updating. I turned the corner on 50 years, almost a year ago, and I’m thinking more and more about my legacy — what I’ll leave behind me in this world, both while I’m walking around here, and after I’m gone. I’m also thinking about those who have come before me… to see what they may have “left” to me, in terms of personality and character. I know some are skeptical about the concept of “cellular memory”, however, intergenerational effects are recognized in terms of emotional resilience and mental health. Plus, recent research has actually shown that daughters inherit corticolimbic circuit attributes from their mothers, and since the biological line from mother to daughter is unbroken, then for sure, women in particular can trace their roots back in a very personal way. Men, too, I’m sure. I just don’t have the research on hand, just now. I know of one DNA test that looks at mitochondrial DNA — which is passed through the matrilineal line. I think there are patrilineal DNA analyses out there, too — possibly from the same company? And you can trace back your matrilineal heritage, waaaaayyyy back. A friend of mine did that once, and it was very cool hearing about who her foremothers were. As for me, I’m going to have to do more digging. There are all kinds of surprises in there, for someone who’s always thought of herself in terms of being west-central European — French, German, Italian, Swiss, with a bit of English thrown in for good measure — and not much else. The Baltic, West Asian, and Eastern Mediterranean are big surprises. And when I dig into the 204 distinct populations, I find a whole lot of surprises. Including many, many Siberian influences, and Eastern European sources, many from along the Volga river. And then there’s the Brahmin from Uttar Pradesh. And Papua. Maasai. Yoruba. And so the quest commences. This entry was posted in writing and tagged ancestry, Baltic, DNA, DNA analysis, East Mediterranean, Eurogenes, family, GEDmatch, genome, heritage, life, MDLP, mythology, North Atlantic, quest, surprise, West Asian, West Mediterranean. Bookmark the permalink.